Situated near the top of the food chain, harbor seals serve as indicators of the health of the marine ecosystem. In the past ADF&G harbor seal research has focused on gaining a better understanding of harbor seal physiology, ecology, and population dynamics. 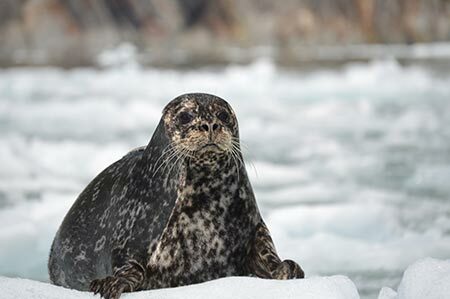 During past research efforts harbor seals were live-captured and sampled in Kodiak, Prince William Sound, Glacier Bay, and Tracy and Endicott Arms, Alaska. These live-capture events resulted in a large archive of blood, serum, skin, and blubber samples that can be used to compare various health and condition parameters for future studies. Currently there are no funded harbor seal research projects.